A few things had me fumbling around, but over the next few contacts I started to get the hang of it. 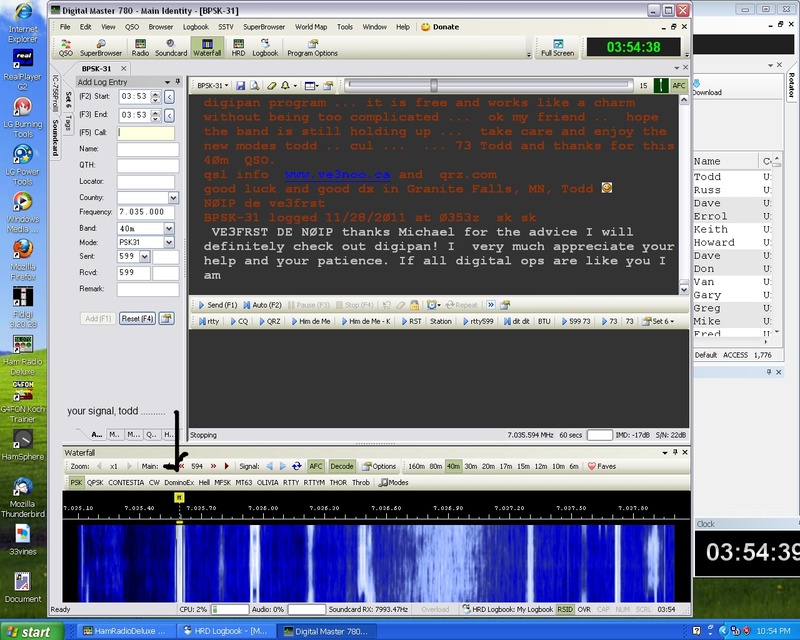 After VE3FRST I went on to work another station in Ontario, one in Alabama, and one in France with PSK-31 before retreating to my key and working Costa Rica with CW. I highly recommend the DigiMaster PRO PLUS! It comes with a USB soundcard and was very easy to hook up and get going with Ham Radio Deluxe/Digital Master 780. It performs both as a CAT interface and as a data interface, and works great. I learned the hard way that not all CAT cables are worth buying. Buy cheap, and you’ll buy twice like I did. My first one was a cheap cable from “affordableradio” on ebay. It uses the Prolific chipset for the serial-to-USB interface. Stay away from Prolific! The only thing prolific about it was the prolific number of spontaneous disconnections and “Blue Screen of Death” crashes. I tried everything — every driver I could get my hands on, I/O buffer adjustments, etc. but it was junk. I couldn’t bring myself to sell it to another ham, so I returned it. No refund yet, but here’s hoping. I haven’t posted in a while because I’ve needed to get caught up since the antenna-project, and whatever time I have had for ham radio I’ve spent on the air! It’s been a blast, too — lately the DX has been like low-hanging fruit. I’ve especially enjoyed DX on 40m. But my son and I started something this week that is too good to keep to myself, so here I am blogging again. 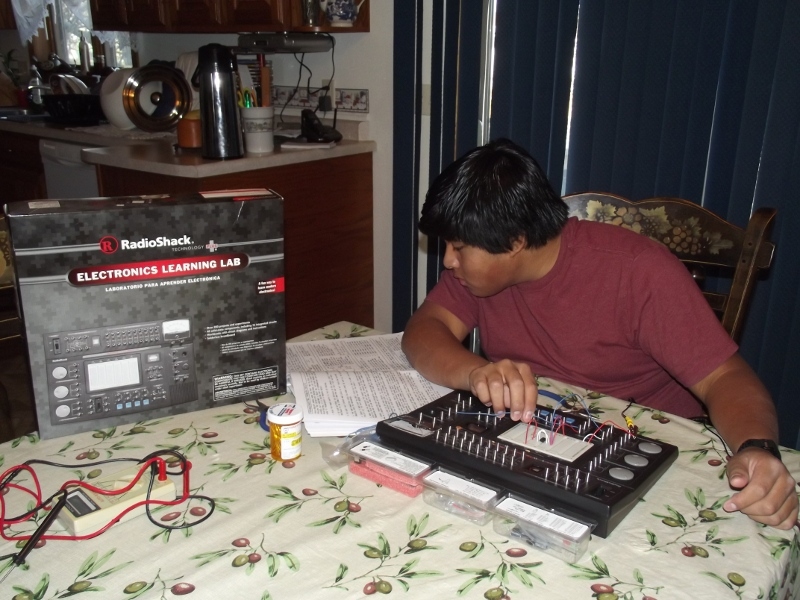 My good friend and brother in Christ, Scott Paulson, spoke highly of Radio Shack’s “Electronics Learning Lab.” As a signalman for BNSF Railway he is constantly going off to school to learn about electronics, and the Electronics Learning Lab is required for his classes. (By the way, guess what one of their textbooks is? The ARRL Handbook!) So this week I dropped by Radio Shack, took a look, and promptly bought the thing to add to my son’s homeschool curriculum. Click on each manual to view the PDF at radioshack.com. Just as Scott told me, “It’s like painting by number.” We only started on it yesterday, yet this morning I found my son working on the next project all by himself, so comfortable was he with the directions in the workbook. I jumped in so I could learn, too. After he finished today’s project we wanted to keep going, but exercised self-control and put it away until next time. 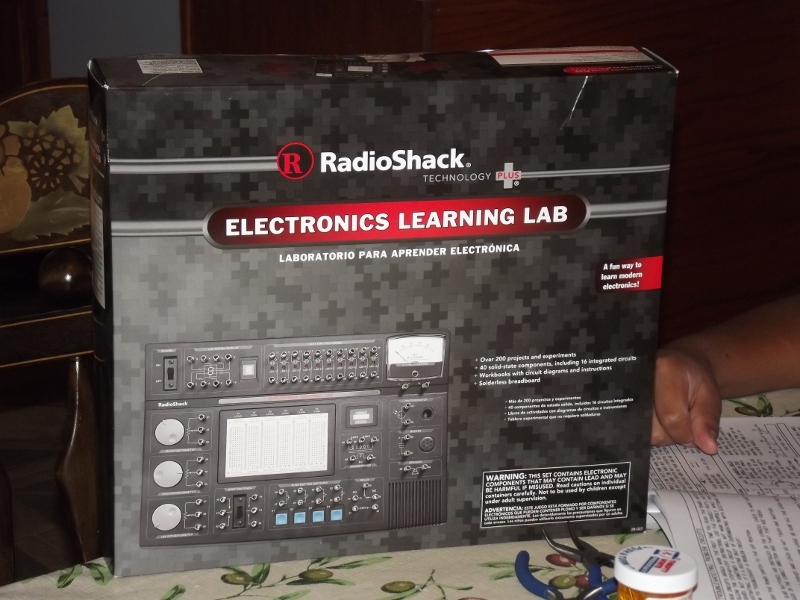 As a homeschooling father and as an Elmer I’d pay double what Radio Shack is asking for this kit. And no, I don’t work for Radio Shack, nor do any of my friends or relatives, nor do I get one red cent from them for lauding one of their products. Whatever your age, if you want to graduate from kit-building to circuit-design, this seems like a good way to take a step in that direction. 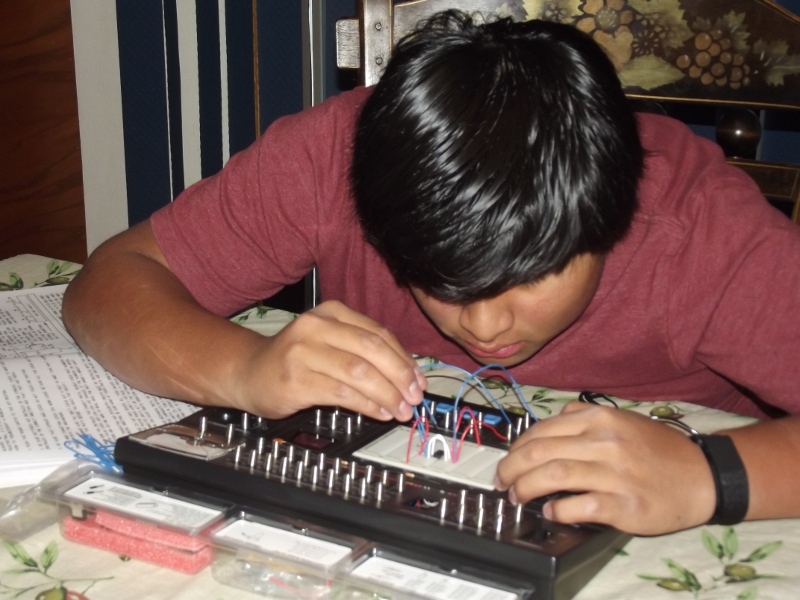 Antonio breadboarding with the Electronics Learning Lab. A couple days ago I made my last entry in the logbook I’ve been using for 33 years. The log has grown up with me and is a bit battered, much like its owner. The first entry I made was on 9/10/78, back when I was a 10-year-old Novice with the call KAØCEM. It’s a trip down memory lane to page through this logbook, not only to read the entries and the notes I made about changes in my equipment and QTH, but even to see how my handwriting changed over the years. But it’s full now, so it is time to start another logbook. The first page of my logbook when I was KAØCEM. I happen to have a nice, new logbook just waiting for the next hand-written entry. Somewhere along the line I acquired it and it’s been on my shelf waiting for the day my first logbook filled up. But now I’m not so sure I want to use it. Things are different now. Back in the day we relied exclusively on QSL cards to confirm our contacts, but now some folks rely on the Logbook of the World — as a courtesy to them I started entering my contacts there this year. But double-logging is as prone to error as it is time-consuming. 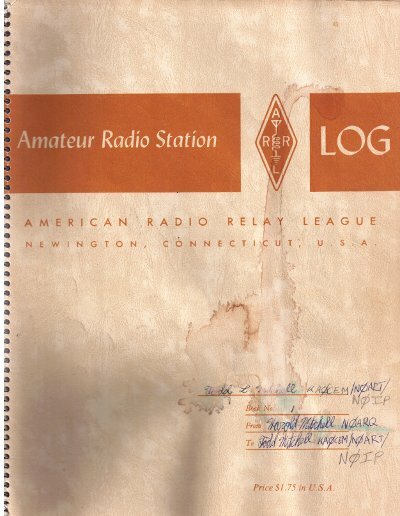 And as much as I love the nostalgia of the hand-written log, I have to admit that logbook in Ham Radio Deluxe is mighty slick. So I’ve ordered the chips to upgrade my Kenwood TS-440S, a CAT cable to hook it up to my computer, and from now on it’s a computerized logbook for me. But one thing is nagging me. There are unanticipated consequences of “progress” like this. 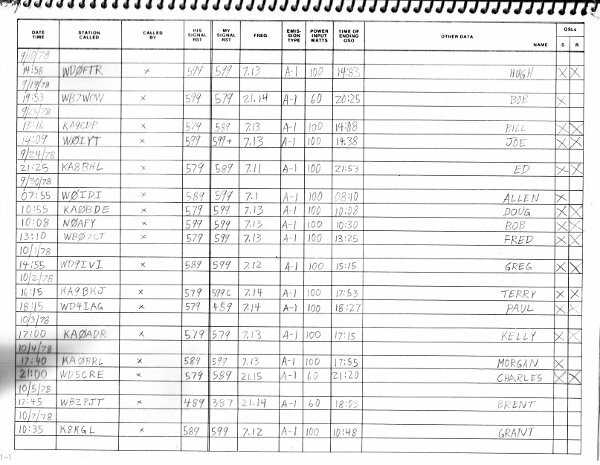 For instance, this computerized logbook has a window with constantly-updated DX spots. Nice, huh? But with this instantaneous feedback-loop that we’ve created, it has become harder and harder to have meaningful QSOs with DX stations — as soon as one is spotted there’s a massive pile-up that turns subsequent QSOs into rapid-fire exchanges that consist of nothing more than NØIP 599 TU. I’m glad my ol’ logbook ended with a better QSO than that. I called CQ DX on 20m and LU1MA responded from Argentina. We didn’t exactly have a ragchew, but at least it lasted for six whole minutes. The second I signed off with him, though, a horde descended upon him like a swarm of thirsty mosquitoes. I don’t remember that ever happening in the old days, even though there were more CW operators on the air back then. Back at the peak of the third-to-last sunspot cycle I had DX QSOs that routinely lasted 10-15 minutes, sometimes longer. That wasn’t because my CW was slow. Back then I was around 20 WPM; now I’m down to 15 WPM (it’s coming back, though!). It was simply different back then, and I would say it was better. I loved how the DX stations used to call me DR TODD; I’d hear it from more than one country, but never from the USA. We talked with each other back then, no matter how far away the DX station was. So I’m not sure I’ll keep that DX spot window open in my new computerized logbook. I’m not even sure I’ll enter pile-ups all that much. I’ve learned how to do it, but it’s tedious and not nearly as rewarding as the contacts I used to have with these DX stations. Maybe I’ll call CQ DX more often and hope the fellow on the other end is willing to spend a few more minutes in QSO than he’s used to. But when I do, he’ll go into my computer. Along with the old days, my written logbook is a thing of the past.